Thailand, Syria and India have each lost their coaches as a result of Asian Cup results. The Asian Cup has traditionally proved a minefield for coaches not used to fierce local rivalries and the tournament’s idiosyncrasies and it did not take long for the merry-go-round to crank into gear in the Emirates. Thailand coach Milovan Rajevac barely had time to unpack before he was fired following the 4-1 thrashing by India in their opening match, before Syria acrimoniously dumped German Bernd Stange. India coach Stephen Constantine quit after the Blue Tigers narrowly failed to reach the last 16. South Korea are looking to end 59 years of Asian Cup hurt – and even replaced fake gold medals for relatives of players who won the trophy in 1960 to lift a “curse” some believe has scuttled their dreams in recent years. They looked distinctly ordinary in beating first-timers Kyrgyzstan and Philippines by a single goal – before their talismanic captain Son Heung-min jetted in from London and inspired them to an impressive 2-0 victory over China, establishing the Koreans as the team to beat. Better known for horseback wrestling, eagle hunting and dead goat polo, Kyrgyzstan were not expected to make much of a dent in their first Asian Cup appearance. But they have done just that after striker Vitalij Lux fired a hat-trick in a 3-1 win over Sven-Goran Eriksson’s Philippines that sent the White Falcons through. The Filipino “street dogs” bared their fangs in a plucky performance against title-chasing South Korea, but war-torn Yemen lost all three games, conceded 10 goals and failed to score on their Asian Cup debut. 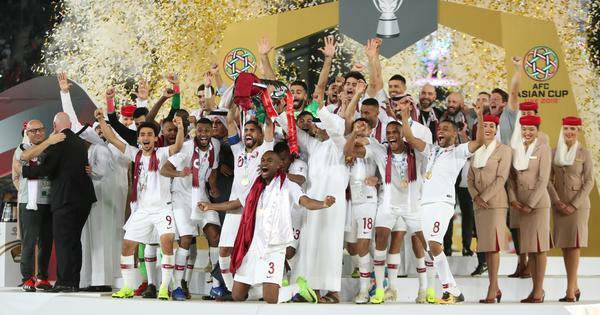 Qatar have never gone beyond the quarter-finals of the Asian Cup but they are quietly going about their business this year, despite suffering a torrent of abuse over a long-running political row. The 2022 World Cup hosts finished top of their group after a 2-0 win over Saudi Arabia, who severed political ties with Qatar in June 2017 over Doha’s alleged support of terrorism – an accusation Qatar denies. Almoez Ali has scored seven goals in three games as Qatar have emerged as title contenders. Hosts UAE secured their place in the last 16 by finishing top of Group A – job done you would have thought, unless you had been forced to sit through their three games. The Emirates continue to look as if they are running through treacle under Alberto Zaccheroni, who won the Asian Cup with Japan in 2011 but looks bereft of ideas with the Gulf side. The Italian will hope they can dispatch Kyrgyzstan next and belatedly kick-start their challenge.